On Tuesday 28 June 2016, representatives from the United Voice of Badagry People Initiative visited Aholu Saheed Sedonu Adamson, the Aholu of Ajido Kingdom, Topon Toyiaga 1. Following his coronation earlier in June of this year, UVOB found the Aholu of Ajido Kingdom in good spirits. Warmly received at the Aholu’s palace, UVOB’s representatives began their interview with the Oba of Ajido Kingdom. He spoke at length concerning fostering unity in Badagry, youth empowerment as well as the recent discovery of crude oil in Badagry. I feel excited because I know this is God’s making, because God is the only one who ordains His King. I feel overwhelmed and I’m grateful for the acceptance of my people – it’s a call to duty to serve my people to the best of my ability. Q. As you are aware, Badagry faces underdevelopment and is still struggling to create unity in its communities. What are your views on fostering unity and attracting development in Ajido and across Badagry? My intention is to work with other Kings in Badagry Local Government and possibly within Lagos State to promote unity, to promote development, to promote progress within the community, to foster unity among us and to ensure that we do things in accordance with the law of the land so that whatever we do, whatever we set our programme on, we see ourselves in Badagry as one – Egun speaking people and Awori speaking people. For me, I don’t like discrimination. I always look at us as Lagosians working for the common good of our people. That is how I want to foster unity amongst the Obas and amongst the people in the community. Q. In terms of youth empowerment, how do you intend to help the youth in Ajido? When I was installed as Aholu, I met many youths in Ajido either in clubs or in different fields of endeavour. During their visits to pay homage, we discussed a lot and that made me say that I would definitely form a committee for youth empowerment .What are we looking at in this committee? We are looking to empower our people, to see if we can bring NGOs to ensure that yes, they all have work, they all have education, they all have skills so at the end of the day we can harmonize all these things together to bring in investors, as we are talking to some investors now to come and invest in Ajido. We have the Gas Pipeline in Ajido right now. We want to talk to them to at least make sure that most of our youths that are graduates and have skills are employed into this organisation. We have Asphalt here too. I will talk to them to assist our youth, the graduates and the skilled to get employment. Apart from that, we are talking to some investors to come and invest. Not only that, I have discussed with some youths to not be idle, we have farmlands so they can go into farming or agriculture to help themselves, because right now I know that white collar jobs are not there anymore. One should try as much as possible to be self-employed. Those are the things I have been trying to advise the youths in my domain and I think they are responding positively to these calls. All hands must be on deck as we are talking to them, and I know by God’s Grace, things will work well for our youths this time around. Q. Some communities are disunited in Badagry, what do you think the problem is and how do you think it can be resolved? As far as I know, I have not seen any disunity amongst any community or amongst us – so far so good in Badagry Local Government Area. Why I am saying this is because I visited some Obas immediately after my installation – after my iwuye ceremony. We were talking together to unite ourselves to ensure there is peace and harmony in our domain. At my last meeting with the Oba of Imeke, we discussed at length how to ensure we tighten up security in terms of some youths that were into bad habits and we said that it was going to be a collective effort. I visited Alapa, and we discussed the same. Unity is the key to any development anywhere we live. But so far so good, I have not seen any disunity amongst Badagry’s people. I think we are one and we will continue to be one. Q. What are your views concerning the recent crude oil discovered in Badagry? I’m grateful that you raised this question. After my installation or rather before my installation, we’d heard of it, of Aje Oil owned by Folawuyo and some other group of companies. But I must tell you that Badagry is the host community – that is the Badagry Local Government Area. Folawuyo Drilling Company is opposite Ajido and it’s about 12 miles within the sea shores of Ajido. 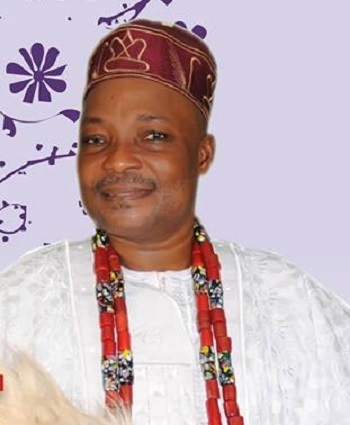 But so far so good – some Obas have come together and approached Folawuyo. From what we’ve gathered so far, we’ve wrote to them and they’ve replied. Very soon, we’re going to meet them to know the benefits and what they have in store for our youths and for the community, I don’t want to talk too much about them, but like I said we are about to meet them, may be in a week’s time. It’s going to be a meeting between the Obas in the Badagry Local Government Area and Folawuyo. After our discussion, I believe something positive will come out of it for Badagry. The Aholu was pleased with the role UVOB played in Badagry as a non-governmental organisation and he hopes that initiatives such as UVOB will continue to make a difference in Badagry. The visit concluded with thanks.